Automate your processes and increase efficiency by over 100% with OHB’s revolutionary software for integrated medicine providers. I used to spend much of my time collecting information in patient interviews. With the OHB Portal, I am now able to focus more on educating my patients and managing their expectations. As a result, I have noticed a significant increase in patient compliance and satisfaction. Before I started using OHB, I had patient notes in multiple places in the pharmacy – our computer system, patient charts, sticky notes on two different desks, and some forever lost in my memory. Now when a patient calls, the info goes directly into the notes section of OHB where my RN or I can access it at any time. Maybe the O in “OHB” should stand for organized. I have worked with Jim Hrncir of OHB for more than 10 years. Jim is a true visionary and leader in bioidentical hormones. I was very excited when I heard about the opportunity to incorporate the OHB software into my practice. Not only is it a very effective electronic record keeper, it is a wealth of important hormone information delivered in a highly practical way. The ability to individualize and ask specific questions makes it something very special. Patients can complete electronically assigned questionnaires from any device with an internet connection and the provider receives the questionnaire immediately upon completion. Manage patient cases by assigning questionnaires, ordering labs and writing prescriptions – all from one integrative medicine portal. Practice confidently with our disease state indications, library of studies, and “send for consult” features all at your fingertips. Have a tough case or just want a second opinion on a quick question? Send it to our OHB Integrative Medicine Experts for review. Providers and patients can login within seconds anywhere, any time. All you need is internet access. The OHB portal organizes relevant patient information in an easy-to-read report for quick review. 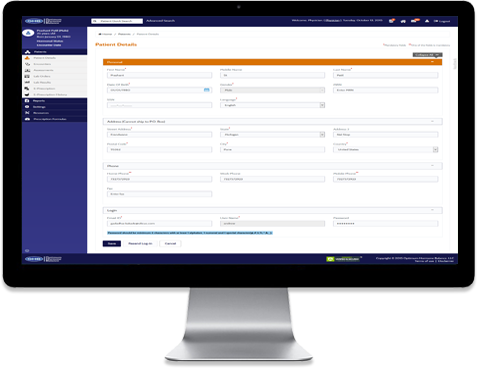 Using the OHB portal questionnaires and reports features gives you a more fine-tuned approach to every patient case without added difficulty. Electronic questionnaires, imported lab results, and easy-to-add progress notes help you manage your Integrative Medicine patient cases in one place. Offer low cost cash labs and supplements to your patients. Upload your logo to and/or customize the color scheme in the portal header. Want to see OHB in action? Schedule a demo today to see how you can start improving your BHRT practice! Have a question or comment about OHB that you’d like to chat about? We want to hear from you!